Holiday Illness Claims have helped a Leeds holidaymaker successfully receive £3,000 in damages following an alleged outbreak of gastric illness at the five-star Azul Sensatori (also known as Sensatori Resort Mexico). Ellen Wilson saved hard for a year to afford her once in a lifetime Mexican holiday only to be met with severe stomach cramps and diarrhoea at the Thomson promoted complex. A mere 48 hours into her much-anticipated June 2015 stay, Ellen was struck by debilitating illness symptoms, leaving her unable to participate and enjoy the many five-star facilities that she had scrimped and saved for. Although she self-medicated, Ellen remained severely unwell for the remainder of her ruined holiday and labels her stay at the resort a total waste of money before adding, This was the first and last time I will go on an all-inclusive holiday. Alarmingly, the Leeds holidaymaker claims that conversations with other hotel guests soon revealed that she was not the only one battling gastric illness. Ellen also claims that although she reported her illness and hygiene concerns to numerous members of staff, she feels that she was simply overlooked and met with disregard. Once back in the UK, Ellens illness ordeal was hard to ignore as the stricken holidaymaker continued to be plagued by repeat illness symptoms for a further month, resulting in a total of 6 weeks of suffering. 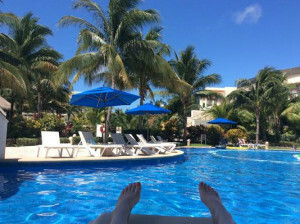 Angered that her once in a lifetime dream holiday descended into an illness nightmare, Ellen resolved to pursue a no win no fee claim for illness in Mexico with industry leaders Holiday Illness Claims. Experienced solicitor Sue Robinson handled every aspect of Ellens claim and successfully negotiated a settlement of £3,000 with tour operator, Thomson. Commenting on the case, Sue said: I am delighted with the settlement and I trust that Ellen is too. At Holiday Illness Claims we understand how distressing falling ill on holiday can be, especially when holidaymakers have saved hard to afford a dream getaway. Thats why we work tirelessly to ensure that stricken tourists receive the compensation they deserve in hassle free, no win no fee claims. I would strongly encourage anyone who has fallen ill at Azul Sensatori within the last three years to come forward and contact Holiday Illness Claims to see if they too can make a claim for compensation. We are only a phone call or click away. If you or your family have fallen foul of hygiene standards on a package holiday within the last three years, help is at hand with Holiday Illness Claims. To see how we can help you, call 0800 01 54321 now and speak to an experienced holiday illness lawyer. Alternatively, simply complete the online contact form and a dedicated Mexico claims specialist will be in touch within 24 hours.